When wedding photographer J Dhillon decided to tie the knot with childhood sweetheart Jiwan, there was only one person he trusted to tell the story of his Big Day – two of the UK’s best wedding photographers, Gurvir Johal and Kunal Gosraani. J and Jiwan first met in the playground of their secondary school. The pair stayed friends all through their teens right up until university, when their relationship flourished into something more. After a few years of dating, J decided the time was right to propose and was overjoyed when Jiwan agreed to share her life with him and be his wife. 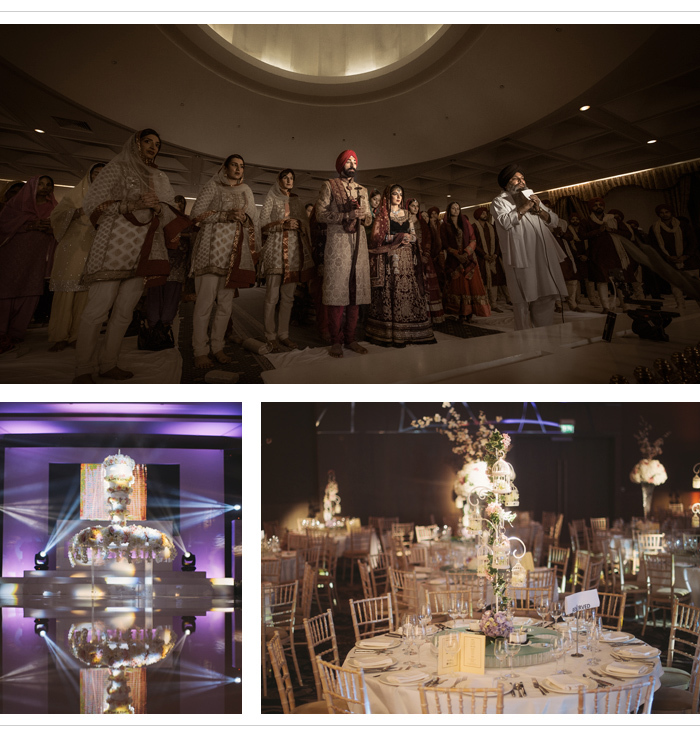 With an extensive list of contacts in the wedding industry, J took the recommendation of caterers Ragamama Ragasaan and booked the Hilton hotel in world-renowned Wembley for their reception. The couple decided on a pretty cream and pink colour scheme for their Big Day, inspired by the cherry blossoms of Japan. The venue was dressed with bunches of freshly cut blooms – pale pink and cream roses were used in the tall vase center-pieces, for the stage display and for cake decoration, while wrought iron bird cages added a vintage touch. The wedding feast was created by Ragamama Ragasaan, who worked with J and Jiwan to create a mouthwatering menu as well as a broad cocktail list to satisfy guests varying tastebuds. A stunning cake made by Sweet Hollywood stole the show thanks to its gravity-defying position. Five tiers of cream fondant were turned completely on their head to produce a uniquely upside down creation and ensured that the cake was talked about long after the party. When it came to saying a few words, J made a touching address to his new bride. “I told her how lucky I felt and how excited I was to be starting this new chapter of my life with her by my side,” he remembers shyly. The newlyweds’ first dance was to John Legend’s All of Me while a violinist played in the background.